It seems to me that in every family/relationship, one person is responsible for certain things. For example, I’m responsible for taking out the trash; gathering up all the various bags, getting them to the big trash can outside, and making sure that it all gets to the curb by Monday morning. My wife is in charge of temperature; she is much more sensitive to the cold than I am, so she picks where the setting on the thermostat is. This theory of mine applies to our kitchen as well. 99% of the time, she is in charge of herbs (she is the main caretaker of our inside and outside gardens; she has a blog over at nearlyhomegrown.com if you’d like to experience some good writing). She picks, cleans and chops the fresh herbs while I’m working on other things. One of the meals she is totally in charge of is omelettes. I’ve never gotten the hang of omelettes. I get the basic idea, and I’ve watched her make them for years, but mine just never come out as good as hers. I make good fried and scrambled eggs, and a fairly good crestless quiche, but omelettes just elude me. 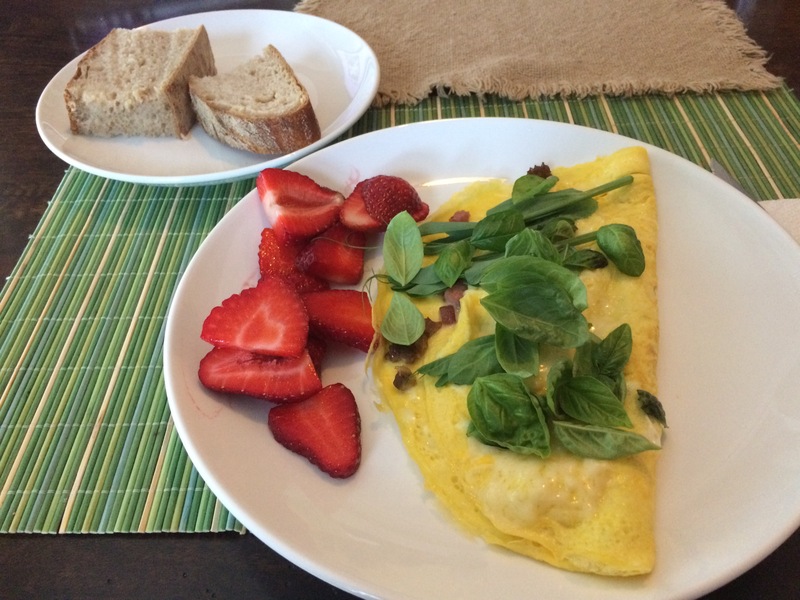 And with more of our ingredients coming fresh from our backyard (pea shoots, basil, and asparagus) or the farmer’s market (mushrooms, eggs) her omelettes get better every year. The strawberries also came from the farmer’s market this morning. The bread is a wild yeast sourdough (I’m in charge of bread).